Mobile phones are small and getting smaller, but the mobile content industry is big and getting bigger. According to mobileSquared, this year £407.1 million in revenue will be collected between mobile content and services along with mobile advertizing and marketing. But every year this tally grows. Mobile advertising is the largest contributor to growth, as expenses will rise from £50.25 million (12% of the total revenue) this year, up to £357.84 (33% of the total revenue) in 2015. During the same time, mobile content and services will grow from £336.73 million (83%) to £703.5 million (64%). In particular, this growth will result from the exploding apps market which increasingly includes mobile phone gambling applications. 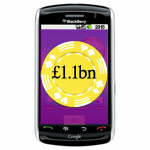 MobileSQUARED’s report is not likely to account for all the nuisances of mobile gambling. Fluctuations in the economy, the legal climate, and even emerging technologies will influence how much people are able and willing to gamble, both in general and enjoying mobile casino games. Future laws and device manufacturers such as Apple could either open or further restrict player’s access to online casinos. Not least, globalization assures that online gambling companies will move their operations to whichever nations provide the best tax havens. This could be a big minus in the UK which has already chased several online sportsbooks to Gibraltar and elsewhere.